With winter fast approaching, sensitive skin is even more at risk of being irritated by harsh conditions. True sensitive skin is triggered by sun exposure, fragrances, soaps, products, the weather, chemicals, inflammatory foods, and alcoholic beverages. It takes time to find the culprit and dermatologists specialize in patch testing and may test for over 100 different substances. Rosacea is usually a constant once it appears. It is characterized by red flushing; small, visible capillaries; watery eyes; and small inflamed bumps; but it can be controlled. Take the necessary steps to treat rosacea before it becomes severe and avoid the triggers that exacerbate it. Sensitized skin is much easier to determine and care for. Skin becomes sensitized from being exposed to harsh, too abrasive products, such as alcohol in lotions, rough face scrubs, AHAs in cleansers and toners. Modify cleansing and skin care routines during the colder months, in dry climates, and in hard water areas. Non-foaming, sulfate-free cleansers, milder exfoliants, and fragrance-free moisturizers suited to skin type will help restore the glow to compromised skin. Do not scrub the skin. Cleanse with only the fingertips and blot dry; never rub the face with a towel. Because so many things, including even gentle active ingredients and professional treatments, can cause superficial flaking and peeling, the temptation to speed up the process by scouring off dead skin cells can be irresistible. Grainy scrubs, baking soda paste, sonic cleansing brushes, spa gloves, buffing pads, loofahs, washcloths, and even towel-drying can spell trouble for sensitized skin. Side effects include redness; burning; prolonged scaling; increased sun-sensitivity; a thick build-up of keratin; and an uneven, blotchy skin tone. Attempting to scrub off flaking and thickened dead skin will backfire. The body quickly produces a thicker buildup to protect itself, just like calluses form after repeated friction from ill-fitting shoes and pedicure paddles. Once this behavior is discontinued, sensitized skin can improve dramatically. Water intake hydrates the skin from within, improves elasticity, plumps fine lines and wrinkles, and helps achieve a healthy glow. When the skin is well-hydrated, it is easier to address dry skin, eczema, seborrheic dermatitis, rosacea, and eczema. Caffeine, alcohol, and smoking dehydrate the skin, so it is best to cut back drastically or stop completely. Running a cool mist humidifier at night will hydrate the skin and help counteract the drying effects of cold weather, dry climate, heaters, and air conditioners. Clean as directed to prevent fungus and bacteria growth. Choose fragrance-free products when possible. Perfumes, mixtures of fragrant essential oils or aroma compounds, fixatives, and solvents can be irritating to sensitized skin and very reactive in sunlight. Do not overheat homes and avoid heat sources like hot stoves, ovens, hairdryers, fireplaces, space heaters, hot showers, and direct sun. This Sunday we set the clock forward, to signal the long awaited coming of spring. High time to set eyes on green rather than dirty white! Mature skin showing winter damage needs its own clock set back, not forward. Coming out of hybernation mature skin is in need of special care and the following 4 step program goes a long way to help renew and rejuvenate. 1. Exfoliate to get rid of accumulated dead, dry cells. This will also brighten the complexion and refine the skin texture. Apply a nourishing mask. 2. Cleanse and Tone daily using revitalizing products. 3. Apply Day & Night regenerating and lifting creams. 4. Repeat Step 1 every 2 weeks. This month we suggest treatment products by Payot-Paris and Ilike Organic Skin Care. Step 2. Fraicheur Cleanser/Toner by Payot-Paris or Rose Petal Milk/Toner by Ilike Organic. Step 3. Perform Lift Day/Night/Neck by Payot-Paris or Glycolic Medlar Treatment by Ilike Organic Skin Care. Over and above the 4 steps, we recommend a special step which does not involve any product. Instead of working on the skin, this routine was specially developed by Dr.Payot to work on the facial muscles, just like going to the gym for the face. In conjunction with high quality products it is very helpful to practice facial exercises, just like going to the gym will enhance the results of a good diet. Dr.Payot Facial Exercise Program can be seen if you click on the link. We hope you make use of these suggestions and enjoy spring time looking your best. P.S. To see any of the products just click on the link to be taken to the page. The last few years have seen a serious growth in the sales of mechanical face brushes, with Clarisonic leading the pack. Here we will try to make things clearer, without the hype. As an aesthetician with more that 25 years of experience, I am quite familiar with the concept of face brushing. In years gone by we used to use and sell lovely little face brushes, some with natural bristles, others less costly had nylon bristles. Even back then, the purpose of using the brush was to enhance the results of face cleansing. Oily skin with blackheads was greatly improved when the person diligently used the brush to spread and work in the cleansing milk or foam. Dry skin also benefited from the removal of dead cells and acquired a lovely glow. Mature skin definitely benefited because of the increased blood flow to the area, which improved nutrition and cell renewal. Brushing was not recommended for very sensitive skin or pustular acne. Sensitive skin may become worse from the brushing action that could irritate. Pustular acne was in danger of spreading the acne causing bacteria by accidentally breaking pustules while brushing. Acneic skin tends to be sensitive and brushing could increase that problem. The advantages I outlined above are still standing, except that the mechanical brushes will do the work for you, like the sonic toothbrushes will clean your teeth. If used diligently, the manual brush will give identical results to the sonic brush. The key here is to actually use it daily. Of course, if one spends upward of $100.- on a sonic brush it stands to reason that one will, at least at the start, use it more than one which cost $15.- It’s all down to psychology: if it costs more it must be better. I would avoid manual brushes with nylon bristles, because they may be scratchy. Natural bristles work very well and need little care. Just rinse well and let dry with bristles facing down, on a towel. Otherwise water will seep into the handle( usually made of wood) and cause it to crack over time. It’s a good idea to disinfect your brush weekly, to avoid creating a bacterial culture in the bristles. Sonic brushes need disinfection as well and if you opt for one you will be very happy with the results, just as happy as when using a common-or-garden variety. True, there’s nothing fancy about the latter and you cannot carelessly mention to your friends you had just finished brushing with the latest gadget. It just does not have the same “cool, with-it” vibe, a must for many people. To conclude, sonic brushes are doing just as great a job as manual ones, but if you want one, just go ahead, but at that price you better use it religiously! Perfect size to take on a trip, will last up to three weeks and takes up minimum space. A great way to try out new products or a lovely, thoughtful gift. Each pouch contains a milk cleanser 30ml + an exfoliant 17.25ml + a mask 17.5ml + a moisturizer 12.5ml. 1. Hyaluronic Time Erase Complex– anti aging. 7. Grape Stem Cell – anti aging, protective. 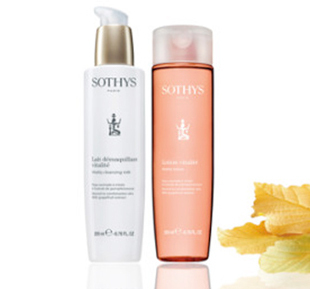 Sothys Maxi Duo Cleanser + Toner Duo in double the regular size.Only the size is bigger, the price is the same as for regular size products. Exceptional value for all budgets. for Sensitive Skin and Broken Capillaries. Four products in each kit : Cleanser 40ml + Toner 40ml + Moisturizer 15ml + Serum 15ml.Great for one week trip or a thoughtful gift. I was inspired to write this by reading another interesting post by Perry Romanowski’s from The Beauty Brains. The answer is resoundingly NO. The skin has a basal layer ( the live layer) which produces new skin cells that travel upwards and become the top layer. At this point these cells are dead and will naturally flake off to make room for new ones, and so on. The whole process takes about 35 days. Stem cells in the basal layer produce skin cells indefinitely, but, with aging the production slows down. This in turn means the natural sloughing process slows down too and this is why aging skin has that greyish tinge : it’s been around too long. Exfoliation takes care of that problem by removing the dead cells and making room for fresh ones to come to the surface. Exfoliating excess dead cells also eases penetration of anti-aging serums and creams and hereby enhances their effectiveness. 1. grainy, mechanical ones that work by gently moving your fingertips in small circles. 2. enzyme peels ( e.g.from pineapple, papaya) which are applied and allowed to work for a few minutes, then rinsed off. 3. AHA like glycolic acid, lactic acid, malic acid which can be done by an aesthetician. 4. chemical peels like TCA done by a dermatologist. Exfoliation is beneficial for mature skin and should be done regularly, as part of a good skin care maintenance program.